The first piece of aviation gear purchased by many aviation students is the headset. Alternative options, such as renting or borrowing from a school, may be good choices too, but often times this gear is worn down pretty badly. No matter how you look at it, you will be in need of your own aviation headset in the near future. Getting your first headset can be daunting. Many students, as I once did, look to other pilots and instructors for recommendations. Those who try this will soon discover that the decision to buy a particular headset is based entirely on personal preference. 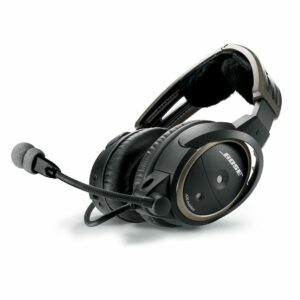 Each pilot has their own wants in a headset that is as unique as the pilot themselves. Because choosing a headset is such a personal decision, you need to think about what matters to you the most before you go shopping. Obviously, you will need somewhere to start. What options do you have, and what are the factors that should affect your decisions? Most popular aviation headsets come in a wide range of styles that offer varying levels of hearing protection. In fact, each offers different types of hearing protection as well. The three types are usually referred to as Passive Noise Reduction, Active Noise Reduction and Digital Noise Reduction. Some people refer to noise reduction as “noise attenuation,” but the terms are interchangeable. Passive Noise Reduction – These are sometimes referred to as NNR headsets, and are the least expensive. They use insulation and thick padding to cut down on cockpit noise. The earphones are designed to create a tight seal around the ears. With these, you’ll receive about 25 decibels of noise reduction. Most of this will be high-frequency noise. The idea of ANR first arose in the 1930s and eventually became part of science fiction novels in the 1950s. It wasn’t until the 1970s that scientists saw it as a real possibility, and it took 20 more years to see this new technology used in the field of aviation. Active Noise Reduction – Like NNR, active noise reduction (ANR) headsets use insulation to protect hearing. In addition, there is an electronic signal that “cancels out” incoming noise to provide noise reduction in the low-frequency range. The electronic signal is not an audible sound, but a frequency pulse that matches incoming sound as an opposite signal. Quality ANR Peltor Headsets can provide up to 30 decibels of noise reduction depending on the brand. Digital Noise Reduction – The most expensive option also gives you the most protection because it adds a final level of protection beyond even ANR. In these, electronics monitor the actual surrounding sounds and mimic them with opposing signals to cancel the noise. Bose headsets and most other quality brands also feature a filtering system that prevents cancellation of non-repeating noises so that the wearer will be aware of changes in engine sound that could signal an emergency. Digital noise reduction provides the most protection in the mid-frequency ranges. You should find out what decibel level of noise you are going to routinely be exposed to before shopping for any kind of aviation headset. (Smaller aircraft generally produce more noise than larger craft, and any prop plane will be significantly louder in the cockpit than a jet airplane). Because the main reason for wearing an aviation headset is to keep your ears safe, you should pay close attention to the amount of sound that ends up reaching your ear. All aviation headsets, passive or active sound reduction, come with a noise reduction rating (NRR). All manufactured aviation headsets are required to be tested by the Environmental Protection Agency to determine how well they reduce noise. The results become the headset’s NRR in the form of decibels (dB). An NRR score of 20 tells you that the headset reduces the amount of sound that reaches your ear by 20 decibels. Some active noise reduction headsets give two scores. One with the electronics off, and one with them on. Once your hearing protection is accounted for, the next thing you need to think about is how easily you will be able to communicate whether it be through the intercom within the cockpit, or outside the cockpit, as you would with other air traffic and air traffic control. To ensure a headset makes it easier to communicate, you must learn a little about its speakers and microphone. There are three common microphone types including dynamic, electret, and carbon. Dynamic type microphones create a balance between cost and usability. With this microphone type, a coil of wire is attached to the diaphragm within a powerful magnetic field. As sound waves interact with the coil and diaphragm, an electrical signal is created that varies depending upon the amplitude and frequency of the sound wave. A downside to dynamic microphones is the magnetic field can run into interference with other electromagnetic fields. When dynamic mics are used in aviation, they are carefully shielded to avoid this issue. Electret microphones are the most popular microphones available for aviation. They are often times much smaller and lighter than other microphones. They work by placing a flexible diaphragm with an electric charge a certain distance from a fixed plate. When sound waves from your voice enter the microphone, the diaphragm will vibrate and change the distance from the plate to the diaphragm. These changes are transformed into electrical signals and sent off for transmission. Carbon microphones are the most basic and cheapest microphone type around. These microphones work by utilizing a moving diaphragm connected to carbon granules within a little container. As the diaphragm is hit by sound waves, the carbon granules begin to move. The resulting movements can be amplified and transmitted as sound. Noise cancellation is all the rage in the aviation world, and for good reason. The less background noise you have bogging down your transmissions, the better off you will be. Any microphone can come with noise reducing features, but electret microphones are generally the best choice. The speakers of a headset are very important, too! With a high-quality speaker, you will have a much easier time you will have understanding the controller talk that seems to move at the speed of light. In an aircraft, both magnetic and dynamic methods for reproducing sound work well. Either way, the fundamental principle is the same. As you receive signals with your headset, the slight voltage changes cause the diaphragm in each ear cup to vibrate. Your brain easily recognizes these vibrations as sound. diaphragms and speakers have the proper air flow, ensuring that they don’t implode or explode as the altitude changes. Additionally, they must be able to handle extreme weather conditions including extreme temperature. As a result, you can’t expect aviation headsets to be made of the same paper diaphragm found in your home stereo. Instead, aviation headsets use metal to create their diaphragms. Most flight lessons only last a couple of hours, but in the real world, cross-country trips are going to take you much more. These long trips are what you should keep in mind when looking at the comfort of a particular headset. At the end of the day, nothing is worse than a painful headache caused by a headset that is too small for your large head. Some things to consider when looking at the comfort of a headset include material, weight, size, whether or not it is adjustable, and the padding. The tightness of a headset against your head is a great deciding factor when looking at how much noise will be kept out. For passive reduction models, this is even more important. However, having a headset that squeezes your head too tight can cause a headache. All pilots are different, so the only way to find the perfect fitting headset is to go and try some on. The weight of a headset may seem like it should be of little concern, but it can actually greatly affect your level of comfort. Headsets with too much weight will strain your neck back and shoulders. It is easy to compare headsets with varying weights because most manufacturers list the weight of the headset in their product description. Traditionally, ANR headsets have required their own power source for the noise-reducing electronics. Usually, this is in the form of a battery pack, though some recent models get the power from the microphone bias. Several models put the batteries inside the ear cups. While this is a compact solution, it adds unwanted weight pushing down on your head. Most aviation headsets place the batteries along the wiring of the headset. The padding amount and material used to create the padding can also make a huge difference. The most important padding is found around the ears and under the headband, as this is where the most tension is applied. This is something you will have to experiment with to find the perfect padding for your head. Every headset has some adjustable parts. Most feature headbands that can be adjusted to position the ear cups correctly. It is important to note that most headsets were designed for use by men, so smaller women will want to ensure their aviation headset has the adjustment options needed for a good fit. Almost every headset offers an adjustable microphone boom as well. This is preferred by some pilots who enjoy placing their microphone boom with precision. Others are completely satisfied with a hinged boom that offers minimal mobility options but still gets the job done. A nice touch offered by some headsets is the ability to swing the microphone from the right side to the left side and vice versa. This allows pilots to place the microphone based on which seat they are sitting in. Finding a headset with your desired boom is important because constant adjusting can get distracting. Lastly, the materials used to build your headset can impact your comfort level. You are going to make sacrifices when looking at the materials of your headset. For example, headsets that use a gel padding are going to be heavier than those that use foam. Some pilots find the gel padding to be more comfortable, though. We would all love to tell the aviation gear salesman that money is of no concern, but in reality, we all have varying budgets. This makes it ever more important to find a headset you enjoy at a price you can afford. Luckily, aviation headsets can be found available in a large array of price points. Some cheap models can be found below $100, and some of the high-end ones can come in at over $1000. While these headsets are very different at the extremes, you can easily find a consistent and comfortable headset in any price range. It should be fairly obvious that the ANR headsets cost quite a bit more than their passive reduction counterparts. Luckily, the prices of ANR headsets have been decreasing since their original release into the market. For a beginner-level ANR headset, look to spend around $300. Entry-level passive reduction models can be found for around $100. At the end of the day, buying an aviation headset is a difficult decision to make, and it is a personal one. It is recommended to try on as many headsets as you can get your dirty little hands on. This way, you will be able to develop a feel for the different types of headsets that are out there. Once you find a nice model, look at online shops for price reductions and sales. The price difference between two retailers on the same model headset often exceeds $100, so keep an eye out. It is no surprise that the best aviation headset available was designed by the leading headphone and earphone company, Bose. We can expect to see a superb microphone alongside some amazing speakers in this bad boy. The great things Tom has to say about this headset are not uncommon among other reviews. People all around the globe praise Bose for providing them with years of amazing customer service and countless hours of comfortable and enjoyable flight time. One reviewer even claims to forget he is wearing the A20 Headset on long flights because it is just that comfortable. I personally opted for the A20 and I don’t regret it. I have been using the headset for over 2 years now and it never let me down during the 100+ hours I used it. With every A20 Aviation Headset from Bose, there are a few extra features that come along with it. Each headset will come with an in-line clothing clip that pilots use to keep the wires out of the way and close to their body. This is one feature that prevents uncomfortable tugging, allowing pilots to focus on flying without distractions. This is likely one of the reasons pilots report forgetting their headset is even on while flying. Another feature found with the headset is an ergonomic control module. Bose offers one of the best control modules on the market. With an easy-to-use interface and an auxiliary input, this control module makes a great addition to the A20 headset. Other items included in the carrying case are a pair of AA batteries, a carrying case, and an auxiliary cable adapter. These tools allow you to put the A20 headset to use the moment you get it. There are two versions of the Bose A20 Aviation Headset. One with Bluetooth and one without. The Bluetooth variation will obviously be more expensive and is available at a base price of $1095.95 (prices may vary). The variant without Bluetooth can be had for $995.95. With a price difference of $100, we recommend picking up the Bluetooth variant. It will pay for itself after many hours of good use. Either way, the money spent will seem like nothing after the years of quality use this headset provides. Does Tom think back to spending $1k on his headset after 7 years of use? Probably not. The Zulu 3 Aviation Headset from Lightspeed is more than likely the second best aviation headset available on the market right now. Second only to the Bose A20 Aviation Headset, this piece of gear offers extremely good comfort, durability, clarity, and performance. When compared with the Bose A20 Aviation Headset, the Zulu 3 is offered at a lower price point with very comparable quality. Lightspeed doesn’t only provide quality aviation headsets, but great customer service and support as well. They boast a 7-year warranty on this specific product, which is sure to protect your purchase for the extent of its lifespan. Most pilots use a headset for around 7 years. If you ever need to contact Lightspeed, they are easily accessible on Facebook, YouTube, and their website. In case you were wondering, this is an active noise reduction (ANR) aviation headset opposed to a passive reduction headset. In fact, Lightspeed has renowned noise reduction technology that has proven to be highly effective and has won several awards. What can you expect from the Lightspeed Zulu 3 Aviation Headset? This headset has lots of unique features found nowhere else. For example, its 99% stainless steel and aluminum construction provides a lightweight and durable headset matched by no other. The light weight of the Zulu 3, in combination with its thick earcup and headband padding make it super comfortable to wear over extended periods of time. There are countless features like these that make it infinitely beneficial to use the Zulu 3 headset. The Lightspeed Zulu 3 can be had for around $850 + shipping and tax. This is a very reasonable price considering what the headset offers and the prices of competing headsets. For the Bluetooth variant of the Bose A20 Aviation Headset, you will be spending well over $1000. Of course, the more you spend the more you get, but the features offered by headsets over $850 are all a luxury and not essential by any means. Note: all given prices are subject to change at any time without notice. Where is the Zulu 3 lacking? For a headset at the top of its game, it is hard to find something to complain about. Where the Lightspeed Zulu 3 lacks most is in the microphone maneuverability. Some more expensive headsets (like the Bose A20 Aviation Headset) have a microphone boom that can be wrapped around the back of the head and placed on either the right side or left side of the face. The Zulu 3 microphone is fixed to one side (the left side). Do note that the Bose A20 is over $100 more expensive, so the absence of this feature in the Zulu 3 headset is more than reasonable. In my opinion, the Zulu is the best of the best when it comes to aviation headsets. The headset makes it easy and effortless to communicate with ATC, navigation tools, and other pilots. Lightspeed has years of experience, meaning you are in good hands when you purchase the Zulu 3 Aviation headset. Tiago is a 21 years old Brazilian citizen living in the United States. He studies civil aviation at Hillsboro Aero Academy and currently holds an airplane private pilot license. Tiago also actively develops and contributes for Mestre Das Milhas, Brazilian travel miles and points related blog, which is the first Portuguese blog in the popular BoardingArea network.